"In VB6 I used to use SomeSuchAPI to perform task X – I have tried to use SomeSuchAPI in my new SuperVelocityStrumCruncher app written in VB.NET, but it won’t work! Help!" And on goes the refrain. When I see these types of questions, nine times out of ten, I know the answer before I even read the question. Or, that is to say, I can pretty much surmise that the answer will fall into one of a couple of typical traps that the experienced VB6 user faces when deciding to use P/Invoke in VB.NET (which, is a pretty relevant question because many times the task you were using the API for in VB6, may just be taken care of by the .NET framework). So, I’m going to cover a few tips that should help the experienced VB6 user successfully make use of Windows or other API calls from VB.NET. That’s right – know your data types. For better or for worse, many of the integral data types that you used to know and love in VB6 have changed sizes in VB.NET. For example, Long is no longer a 32-bit Integer – it’s 64-bit. So, forget what you knew about integer types and their sizes in VB6 and learn them a new in VB.NET. This table is based on the information found here. If you were to use this declaration in VB.NET, it would work – but, there are a couple of other levels of enlightenment that can be achieved here on our way to API Nirvana! 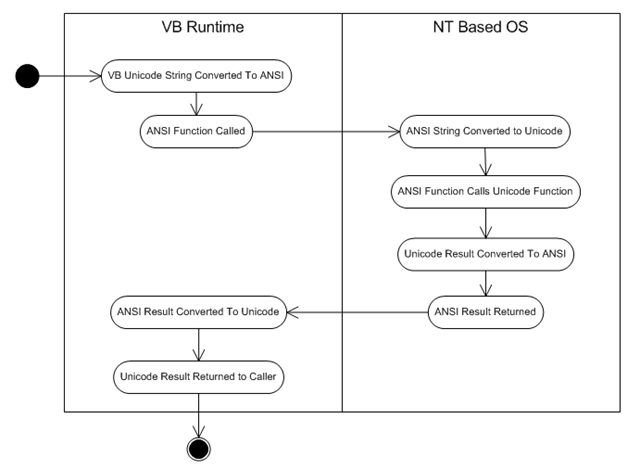 Any one else remember the bad old days when a seemingly simple call to an API call from VB could cause gyrations such as these to occur on NT based OS’s? Well, fortunately, the VB.NET marshaller has improved significantly when it comes to handling of strings. For instance, it can call the W functions directly without the need for hacks using StrPtr or creating custom API typelibs. And, as if that wasn’t good news, it actually gets better! You don’t even have to alias your functions anymore. The venerable old Declare statement has a new option in VB.NET that lets you declare the character set that should be used when calling the function. 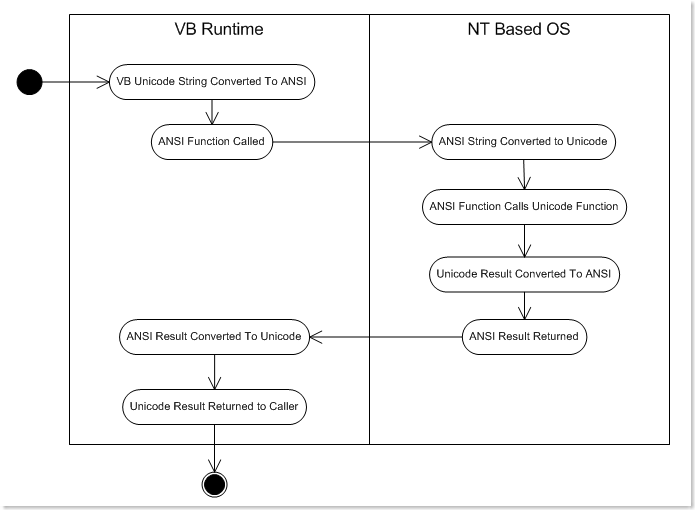 There are 3 choices – Ansi, Unicode, and Auto. When dealing with the A/W function set of the Windows API, Auto is often a good choice because you can just declare the function and let the .NET runtime worry about if it should call the A or the W version. The last bit of advice that I’m going to render in this article is about handles. In the Windows API the concept of handles is very important, and handles are used all over the place. When ever you are dealing with a handle type (such as HWND), then it is recommended that you use System.IntPtr as the type for that parameter over Integer. The main reason for this is that the IntPtr is a wrapper over an unsigned system sized integer – so that means that it is 32-bit on 32-bit systems and 64-bit on 64-bit systems. See how that works? Anyway, it might make your porting life in the future easier if you remember that little tip.